While Mark Fell is highly regarded in electronic music as a singular, uncompromising, post-rave experimentalist—a reputation earned via his early duo with Mat Steel, SND, his solo work under his own name and Sensate Focus as well as his numerous collaborations with other musicians, both electronic and otherwise—his interests are much broader than music alone. His work as a visual and installation artist has been a parallel and increasingly more prolific strand for years that he’s presented in spaces all over the world. All of this brings us to Intermetamorphosis, a weekend offering the most comprehensive overview of Fell’s practice yet that was commissioned by Porto’s Museu de Arte Contemporânea Serralves, one of Portugal’s leading contemporary art institutions. 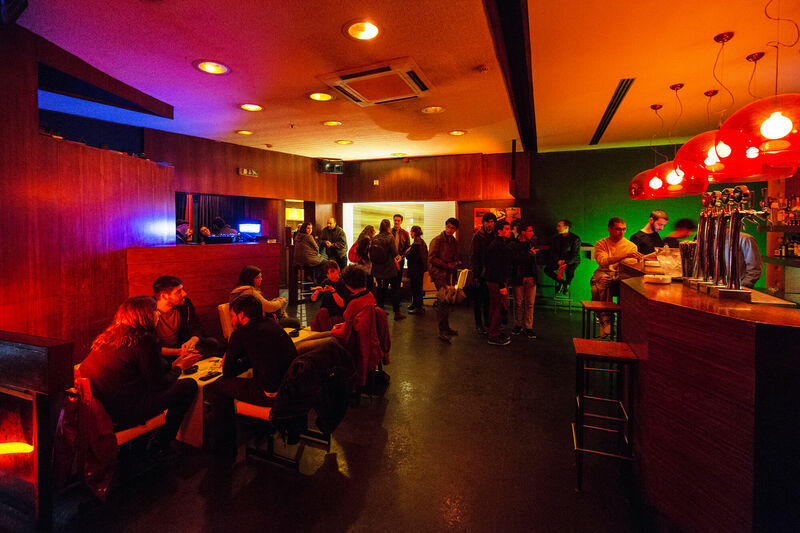 Porto’s unusual Passos Manuel—a bar and club in the city center with two tiny floors and, crucially, a small cinema—played host to several events, including two nights of film screenings. Possibly his most obscure works, the six films ranged from somewhat predictable to his interests—meditations on sound, light, and color—to a drily documentarian collaboration with Scottish filmmaker Luke Fowler, to genuinely surprising and revealing experiments. Both Topaz & Bipolaris, made with Finnish filmmaker and video artist Erkka Nissinen, and Fell’s own reflexive Every Object Is The Mirror Of All Others are deeply philosophical and warmly personal, featuring members of Fell’s family. The former is a surreally funny speculation on musical communication while the latter provides key insight into his working methods via a kind of deconstructed familial self-portrait. The importance of family to Fell was reinforced again with an appearance by his son, Rian Treanor, who DJed alongside Fell’s solo live set as Sensate Focus in Passos Manuel’s small basement club room. While Treanor is now an accomplished producer in his own right and on the verge of releasing his third EP, his DJ set was an exploration of off-kilter dance floor oddities. Senate Focus moved from the warm tones we know from the records through a total rhythm complexity workout that was at times harder and more algo-rhythmic and robotic than we might expect—even from Fell. In the chic, modernist museum spaces of Serralves, an unlikely place for a Mark Fell moment was the restaurant, where one of his generative compositions gently soundtracked diners’ meals. An elegant work of calm keyboard FM synthesis, a few chords float discordantly around a central key. In the well-appointed auditorium, the premiere of a new collaboration with Porto’s own Drumming–Grupo de Percussão percussion ensemble was an intriguing new direction for Fell. Four members of the classically-trained Drumming, each performing on a microtonal aluminium metallophone originally designed by Xenakis, performed pieces made by the un-musically trained Fell, who doesn’t read or write music in the traditional sense. The percussionists replicated what they heard via in-ear headphones—Fell also employed audio signals for various instructions—on unusual instruments for a heady experiment of digital-to-acoustic transformation. While the music came across largely as procedural—Fell himself spoke of it as system-based composition/performance, and much of his electronic output has been made with such methodology—with each piece demonstrating a different technique on the metallophones, the precision of the players, the range of timbres and the unique set-up implies that this project could develop in fascinating and potentially beautiful ways. 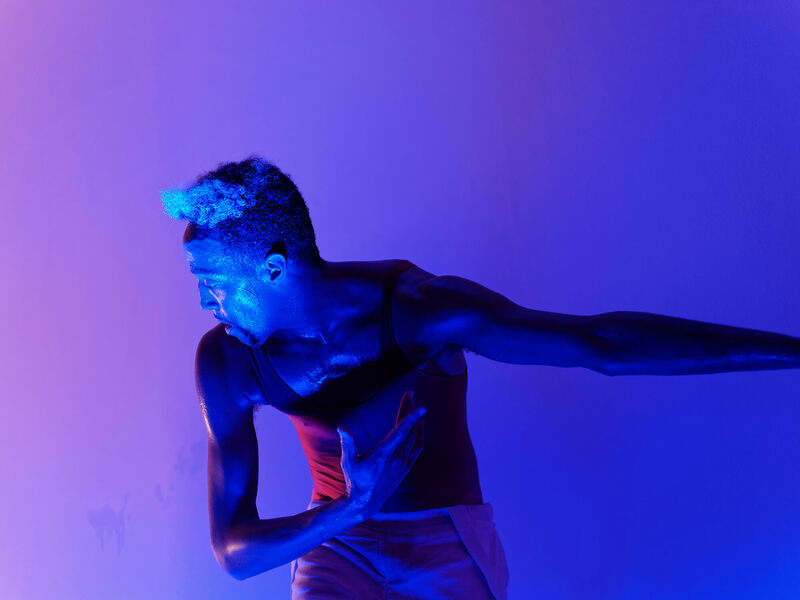 As exciting and new as the Fell/Drumming collaboration felt, the real centerpiece of the weekend was Fell’s installation, which culminated in a finale performance with dance artist Justin F. Kennedy within its confines. On its own, the two-room environment first sent any viewer into darkness on a single path narrowly defined by close-set curtains. Disorienting with sensory overload—strobes, disembodied voices, lazer synth blasts—the path emptied you out into a larger second room lit in pink and blue, featuring a twinkling generative composition that travelled around a small constellation of speakers hanging from the ceiling at various heights. It was complemented by the sound of a robot gamelan ensemble laid out in a circle in the middle of the room and the regular crash and hiss of a tennis ball machine discharging lobs against a giant sheet of metallic emergency blankets that formed a huge cymbal of sorts. 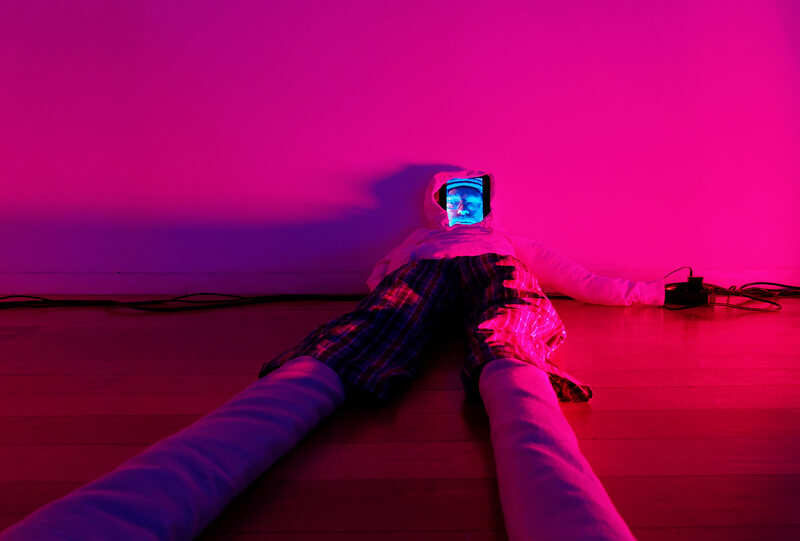 In the corner, a long-legged, stuffed effigy of Fell—the face of which was video of his own face, eyes darting from side to side, displayed on an iPad—observed as visitors entered. While already a surprisingly sensual and soothing environment with a touch of the absurd that you could easily spend hours in, Kennedy’s entrance and performance emphasized the sensuality and tactility of the installation in the museum setting—usually a somewhat sterile place. With all of the grace of a trained dancer, he moved around the room in layers of costumes, sometimes disrupting, sometimes interacting, sometimes responding, eventually stripping down to a leotard and bare feet, but always a charismatic focal point of writhing humanity and blooded physicality in a room full of automation. Climaxing in an auto-destructive whirl accompanied by additional digital noisy squall—courtesy of Treanor—ripping down the sheet, turning off each of the colored lights one by one, the whole happening gently wound down as Kennedy slowly twirled within the circle of the gamelan, only to its gongs, like a ballerina in a music box. Taken as intended—a full weekend of events and programming—it’s clear that year on year Fell’s output is only becoming more expansive, more daring and more complex. As Fell’s work progresses, so too do his interests and ambition. There are few, if any, other artists from a working-class rave background coming up in the experimental electronic underground, whose work also allies so closely with world-class contemporary art institutions. Intermetamorphosis felt challenging, exciting and somehow refreshing, energizing for one’s own appetite for aesthetic meaning. Impressive to think that, ultimately, it hinged around only one artist.